We are often asked where our food comes from. 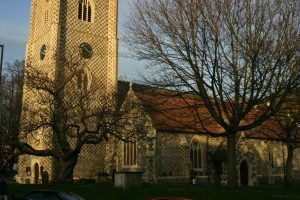 Traditionally we have had collection points in locals Churches where members of the congregation donate regularly or at least at Harvest time. This still happens. We have also benefitted from School Harvest Festivals. 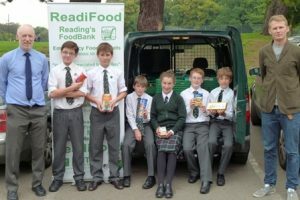 Pictured right are pupils of St Andrews School, Pangbourne who have supported us for many many years. In 2012 we negotiated with local Waitrose stores to run weekend collections where shoppers were able to donate to the food bank. This we have continued to do two or three times a year. Not long after that Trussel Trust and FareShare negotiated a similar arrangement nationwide with TESCO. We have had collections in the local large stores twice a year for some years. In addition to weekend collections, both TESCO and Waitrose now have static collection points where shoppers can donate at any time. We are very grateful to FareShare for facilitating this.